This Buffalo Lick may be identified with Big (Salt) Lick, just to the south of the modern city of Cincinatti, Ohio, as the active flint quarries show this area to have been occupied by the survivors after the Holocene Start Impacts. FWIW, that stretch of the Ohio was one of the most densely populated Paleoindian centers before (presumably) the big changes. More people --> better chance of survivors ? On one occasion I heard the guide at the nearby interstate visitor's center tell a European visitor that no Indians had lived in Kentucky. But then, he's not the only person I have ever met who is more than willing to share their ignorance. Some even get paid for it. Survival in impact events depends on many things, among them a food supply. "The Hool-poom'-ne lived on the east side of the lower Sacramento River, beginning a few miles below the place where the city of Sacramento now stands. Iinformants not identified by Merriam. They may exist in his notes. handed down by word of mouth; from generation to generation they have been repeated, without loss and without addition." sitting by his han-nā'-boo or roundhouse. Wek'-wek flew close to him and saw him well. "You! play hand-game with the Giant Ke'-lok!" "Yes," answered Wek'-wek, "I want to play hand-game with Ke'-lok." Then his grandfather told him that Ke'-lok was his elder brother. "All right," said Wek'-wek, "I'm going to play the hand-game with my brother." Ke'-lok's place was at Tah-lah'-wit, the north. stand it up on top of Ke'-lok's round-house so it could be seen a long way off. but if he was killed it would fall. [This "feather" was most likely a comet's tail. Note that Ke'lok's round house was in Tah-lah-wit, the north. "Brother, I have come to play hand-game with you." and heated them until they were red hot. Then Ke'lok said, "My young brother, you begin first." "No," replied Wek'-wek, "I want to see you play first; you begin." for he was great and powerful and could do all things. As Ke'lok went up into th4e sky he made a loud noise. and as he came down he sang a song. but he purposely missed him, for he did not want to kill his brother. that was the only place on his body where a blow would kill him. Wek'-wek answered, "I can easily hit that, but I don't want to kill him." So he threw all the hot stones but he took care not to hit the white spot under Ke'lok's arm. and put them back in the fire to heat again. Then it was Ke'-lok's turn. just as Ke'-lok had done. and came toward Ke'-lok's roundhouse. Then Ke'-lok began to throw the hot rocks at him and tried hard to hit him. for he thought he would not really be killed, believing that the magic of O-let'-te would keep him alive. So Wek'-wek let Ke'-lok hit him with the last rock. Ke'-lok did hit him and he fell dead. Then Ke'-lok picked him up and hung him on his round-house. and when Wek'-wek was hit he saw it fall. and they both mourned and cried. Then O-let'-te said to Mol'-luk, "I'm going to play hand-game with Ke'-lok." and set out on the far journey to Tah-lah'-wit. When he arrived at Ke'lok's round-house he said, "Well, how are you getting along?" Ke'-lok answered, "I'm getting along all right." Then O-let'-te said, "I have come to play hand-game." just as he had done before. When the rocks were hot he asked, "Who will play first?" O-let'-te answered, "I'm an old man, but I'll go first." -different from the songs the others had sung. Then Ke'-lok began picking up the hot rocks and throwing them at him. and he dodged all of the eight rocks so that not one hit him. I feel now that I am done for," and he was afraid. "I'm old and tired of playing that way. Do you think old people can beat young people? I don't know, but I'll try anyhow." and O-let'-te's turn to throw the hot rocks. way, singing his own song. one after the other, until he had thrown four, but did not try to hit him. As soon as Ke'-lok was dead his fire sprang up and began to burn and spread. Then O-let'-te went to Wek'-wek and took him in his hands. roaring with a mighty roar, consuming everything in its way and filling the air with flame and smoke. and to stay with them while the world was burning. until the fire had burnt over all the land and had burnt itself out. While with them he killed a great many ducks. he killed only what he needed to eat. [Given the rise in sea levels, good luck trying to find anything on the Alviso mud flats. and send me a stack of cash? 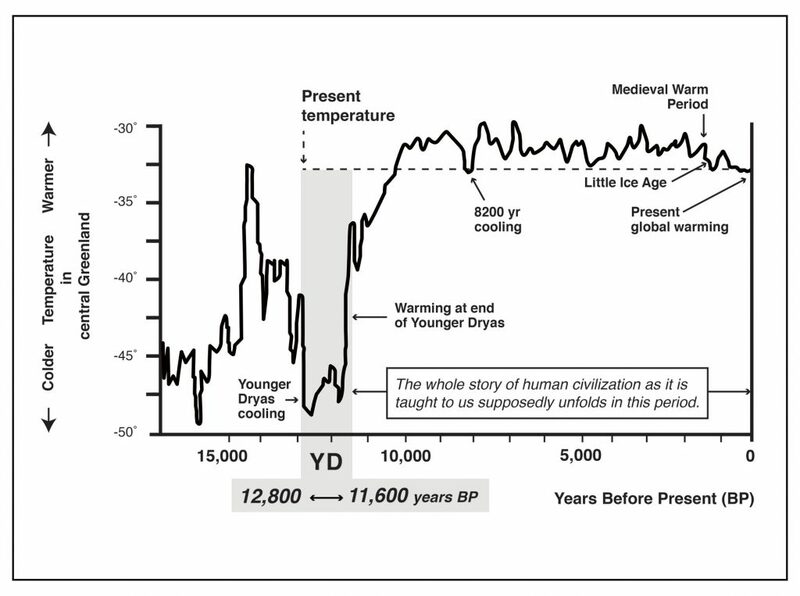 Hancock gives no source for this chart, but note the TWO distinct temperature changes.